Madinat Al Soor is a 50 hectare site located within Waterfront City, a high profile mixed-use development planned by OMA in Dubai. Intended as both a residential and resort district, the design of Al Soor builds on the traditional vernacular town structure and on the patterns and elements of traditional Islamic garden design. The Landscape Strategy for the Madinat Al Soor is comprised of three intertwined and overlaid landscape networks: the Interstitial Spaces, the Semi-Private Spaces, and the Major Public Spaces. 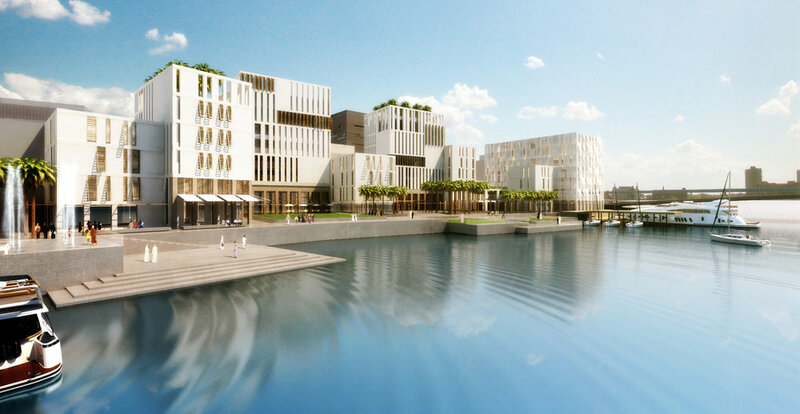 Through these strategies, the Madinat Al Soor landscape will create a richly textured environment with a series of unfolding unique open spaces. The landscape spaces work in harmony with the architecture to reinforce Madinat Al Soor’s unique character. Trees, shade structures, and trellises, some of which recall the intricate latticework of traditional mashrabiya screens, create sheltering pools of shade. Sprinkled throughout the area are playful water features that provide visual brilliance and evoke a feeling of cooling. The Al Soor District will be planted with regionally-appropriate species using a layered planting strategy which simultaneously integrates the District and defines specific neighborhoods, roads and spaces within it. The Semi-Private Open Spaces are assigned one of five color garden typologies. Smaller trees, shrubs, groundcovers and vines provide the palette for these dense courtyard gardens. The Major Public Spaces have distinctive signature plantings which further define each public space.